The Deepenator tab in the SciFi Plugin allows you to pitch scale your voice into a monster, radio personality, or helmeted villian. This type of effect has been used in many different movies in varying degrees. Some examples where this effect has been used are from: Star Wars, the Empire Strikes Back, Return of the Jedi, True Lies, and many others. The SciFi deepenator is a stereo process, meaning that the left and right channels are analyzed independently. There are controls for right and left channels, respectively. 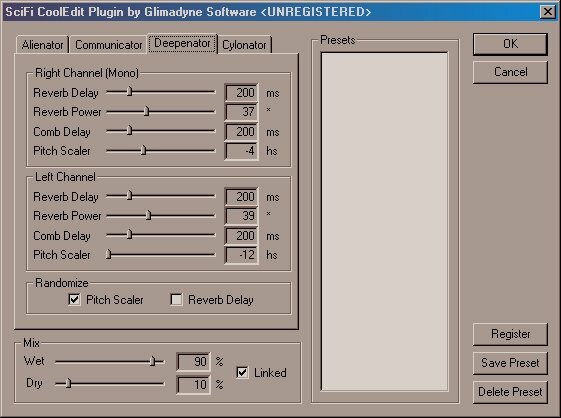 Sets the delay, in milliseconds, of the reverb applied to your voice. Increasing this value will add a longer reverb time, resulting in longer delayed echoes of your voice. Both left and right channels have independent controls. Sets the strength of the reverb applied to your voice. Increasing this value will increase the intensity of the reverb. Both left and right channels have independent controls. Sets the delay, in milliseconds, of the echo to your voice. Increasing this value adds more echo. When used in conjunction with the Reverb Delay Slider, you can emulate differing helmeted effects and sizes. Both left and right channels have independent controls. Sets the amount of pitch scaling applied to your voice, determined in half steps of an octave (there are 12 half steps in an octave). A value of 0 corresponds to no shift. A value of -12 corresponds to shifting your voice down one octave. A value of 12 corresponds to shifting your voice up one octave. You can emulate lowering your voice by setting the pitch scaler negative. You can raise your pitch of your voice by setting the pitch scalar positive. Both left and right channels have independent controls, so you can apply different pitch scalers to each channel. These controls provide some randomization of some parameters to create interesting effects. When enabled, selects a new random Pitch Scaler for each block of data. The new pitch scaler is selected within a range of the specified value from the Pitch Scaler Slider. Thus, if you selected to lower the pitch of your voice, the new random pitch scaler will most likely be negative values, so the speech cannot jump from low pitch to high pitch instantaneously. This is applied to both channels. When enabled, selects a new Reverb Delay value for each block of data. The new reverb delay will be less than or equal to the value specified in the Reverb Delay Slider. This is applied to both channels.